Kitchen islands are one of the most coveted assets our clients request. If an island is top of your kitchen wish-list, read on to find out which size and shape makes sense in your space. More dedicated prep space. Islands tend not to get cluttered like counter tops do. You might put a collection of cookbooks or your mixer on your counter top. You probably wouldn’t do that on your island since there’s no wall for them to sit up against. Provides opportunity for seating. An island is a great place for you to prepare food while your kids do homework on the other side. Serving or buffet space. And island is a good place to set out party foods people can access without having to cross into your cooking and prep zone. Add variety to your design. Islands are a great place to have a different cabinet color or counter top material. This can add depth and texture to your design. Incorporate salvage. Antique tables and workbenches make great kitchen islands. Islands provide room for cabinets in kitchens where wall space is taken up by doors and windows. Islands take up a lot of space. You need room for a walk path on all sides. Plus an extra foot or two if you have seating at the island. They can be expensive. Unlike wall cabinets, all sides of an island are exposed and need to look nice. This means more material, paneling, etc. Also, large islands require large counter tops. Many counter top materials only come in set widths and have to be joined together to make larger slabs. They’re not always the best fit for your room shape. That’s why we wrote this article – read on for more tips about whether an island is a good fit for your kitchen. When homeowners try to squeeze an island into a narrow or irregular space, it can make things feel tight and constricted. 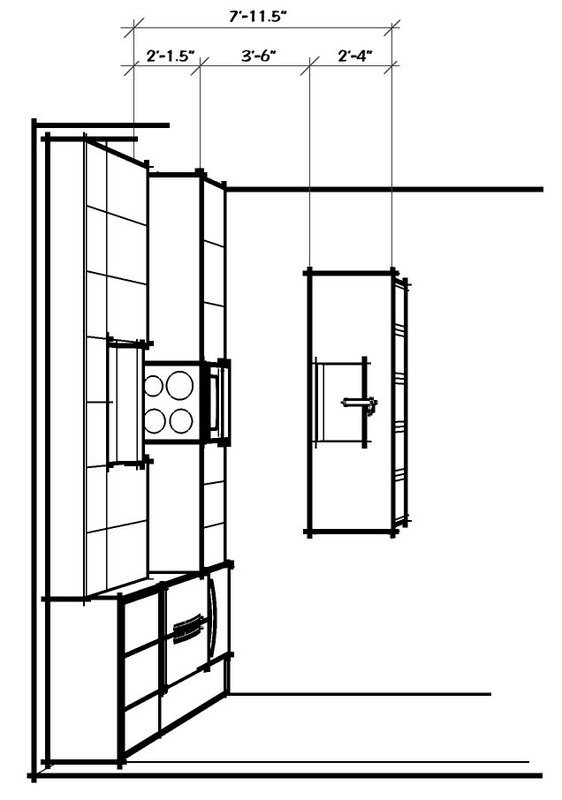 The narrowest island we recommend is a 2′ base cabinet. Add another inch onto the back to allow for some decorative panels since base cabinets do not come with finished backs (you can order extra cabinet doors to serve as panels). 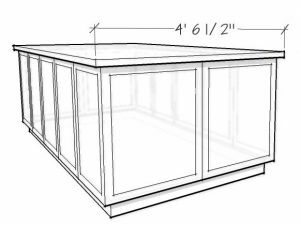 The counter top should overhang 1 ½” on all sides, so the surface will be 2′-4” wide (cabinet + panels + counter top overhang). If you need something narrower than this, we recommend using furniture instead of a cabinet. A very narrow cabinet island (using 12” or 15” cabinets) looks like a weird sliver or an accident. A worktable or butcher block, by contrast, doesn’t look odd at a narrow width (18” would be nice if you’re tight on space). If you want to run power or plumbing into the island, you should put a knee wall along the back. Use 2×4 studs and wrap with either a decorative material (chalkboard, reclaimed wood, ship lap siding), or ½” thick gypsum board. 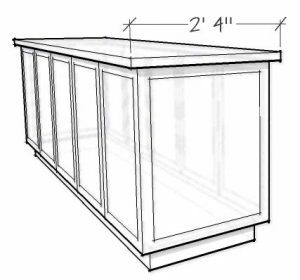 This will give you an overall width of 2′-7” (cabinet + 3 ½” stud + gyp board + counter top overhang). To get a little more space but still have a slim profile, you can add a 12” or 15” deep cabinet on the back side. Or, you can overhang your counter top by 12-15” to allow for seating space. Or do a combination thereof. The surface on this island will be 3”-3” to 3”-6” wide (2′ cabinet + 12-15” cabinet or seating space + counter top overhang). As with the 2′ island above, you may want to add a knee wall between your two cabinets for plumbing and electrical. Add 3 ½” to the overall width to account for the stud. Note: if you only have an overhang on the back for a seating area, we recommend building a side panel that hides the foot space or providing decorative support brackets. Without this, your counter top overhang can look a little flimsy. The exception is if your kitchen is very modern and sleek. A simple overhang with a nice thick counter top can be an appropriate detail in that case. 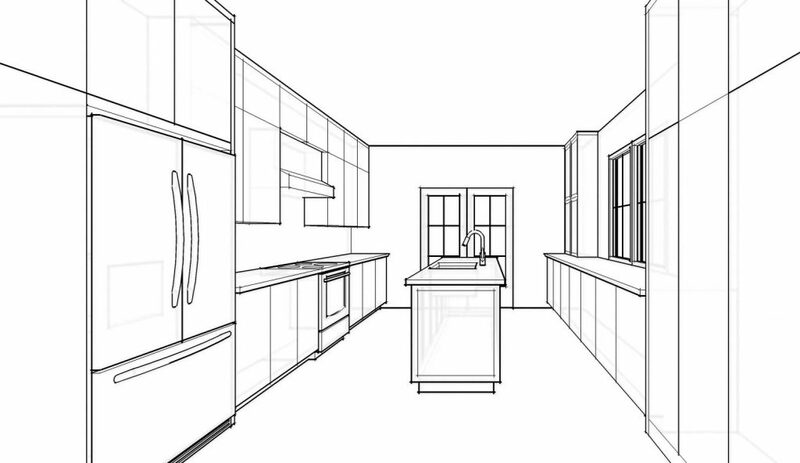 The biggest island is two, 2′ cabinets placed back to back. These usually have a knee wall sandwiched in the middle (because if you’re going big, why not go all the way??) for an overall width of 4′-6 ½”. 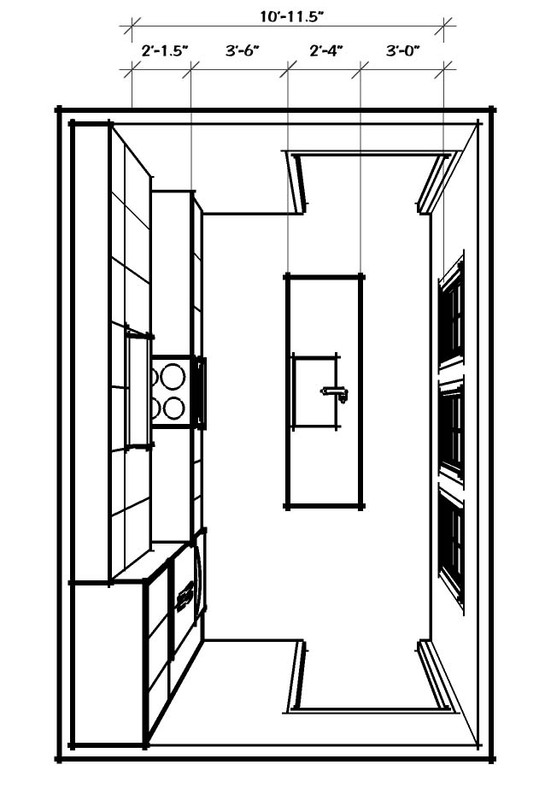 This accounts for the two, 2′ cabinets (4′), plus the 3 ½” stud space, plus counter top overhang all around. If one side of your island faces a wall or windows (as opposed to another prep space), you can get by with a minimum of 3′-0” clear. On all sides where your island faces other prep areas (counter tops, stove, sink), you should have a minimum of 3′-6” clear. 4′-0” to 4′-6” is ideal. You can stretch it up to 5′-0” or 6′-0” if it works better for your space. Beyond that, it’s a trek to get from your island to your counter top, especially if you’re carrying a roast turkey or a large stock pot. Armed with the information above, it’s now possible to calculate minimum kitchen widths to determine whether you can fit an island in your space. Here, your minimum width will be 7′-11.5” (let’s call it 8′). 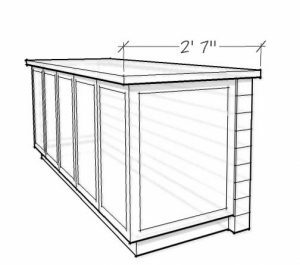 That’s 2′-1.5” for cabinets, 3′-6” for walk space, plus the depth of your island. I assumed a 2′-4” island since I’m giving a minimum width. Again this requires an open concept plan since your second walk path is part of a neighboring room. The next widest is a kitchen where you have base cabinets along one wall (or an L-shape), then a walk space, then your island, then another walk space. The outer walk space is usually a continuation of the house hallway or is a path to a back door or patio. It’s the “through space” whereas the first walk path is for people working in the kitchen. This room is a minimum of 10′-11.5” wide. That’s 2′-1.5” for cabinets, 3′-6” for walk/prep space, at least 2′-4” for an island, and 3′-0” for the outer walk space. If you have a traditional floor plan (no open concept), this is the skinniest your room can be and still allow for an island. The widest kitchen configuration is one with cabinets along the outer walls and an island in the middle. 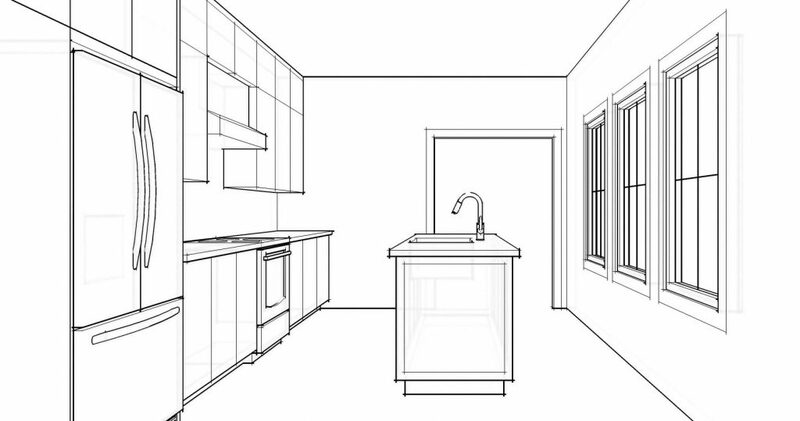 This essentially acts like two kitchens in terms of the amount of prep space. This room will be a minimum of 13′-7” wide. 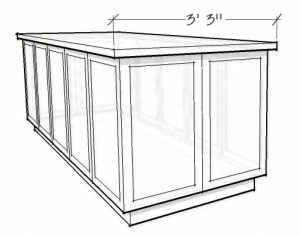 That’s 2′-1.5” for cabinets, 3′-6” for walk space, at least 2′-4” for an island, 3′-6” for your second walk space, and 2′-1.5” for your second run of cabinets. Peninsulas and work tables function similarly to islands, but are more flexible. Peninsulas save space since you only have to leave walk space on three sides (as opposed to four). Work tables are versatile because you can have a large one with space for dining, or you can get a compact butcher block on casters that can be wheeled away to keep things open. How an island fits in your kitchen is consideration #1. However, for the most efficient use of space, you must consider how circulation space in the kitchen relates to adjacent rooms. Because islands need circulation space on all sides, try to align that space with the circulation space coming and going from the room. If you can move continuously from the dining room, through the kitchen, to the mudroom or back patio, the space feels more open. If you have seating at your island, be mindful of what’s happening behind the seating. If your space is snug, you don’t want your stools up against the main thoroughfare of the room. Instead, back the island up against a bank of windows. Especially in older homes, windows are too low to fit cabinets beneath anyway, so they make an excellent backdrop to island seating. Unless you have a very large kitchen, we advise against breaking up your island with varying counter top heights. Sometimes islands are designed with a narrow strip of bar-height countertop above the main slab. When space is at a premium, we find this makes your island less versatile and eats up precious prep space. Want to see how we’ve used these guidelines in our own design projects? You’re in luck! We put together a PDF showing 5 kitchens designs we’ve done featuring islands. These before/after floor plans show exactly what changes were made and how adding an island improved the function and layout of the space. Very informative article. I am in the middle of renovation. 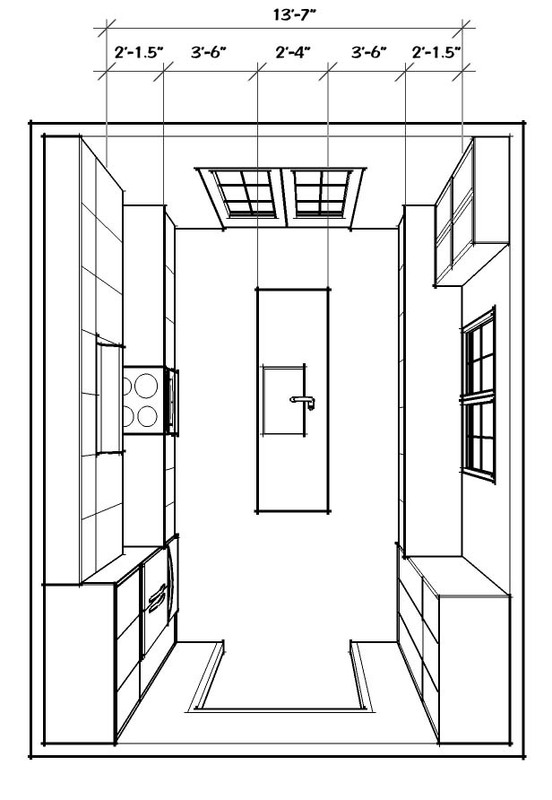 Kitchen torn down and I do not have a layout or plan I am settled on. So much anxiety. I have a very small kitchen. A 12ft X 10Ft, Now completely gutted. Can you make suggestions for me for a layout with a island or Peninsula. I opened the wall to the dining room. It’s a L Shaped Kitchen, One side will be my cabinets and stove, the other wall has the door to the deck that opens inside. Then the back wall with the sink. I am having trouble figuring out how to get around that issue. Hi, Keisha! Thanks for your comment and apologies for my late reply. Did you go with an island or peninsula? We often go with peninsulas in smaller kitchens so you don’t have to have 2 walk aisles around the island. Hope the project is going well.